Nearly two years on from vocalist Blaze Bayley's surprisingly impressive comeback with 2000's Silicon Messiah (following his hideous performance on the two MAIDEN albums that he appeared on), BLAZE have returned with an effort that essentially picks up where its predecessor left off, with its darker and moodier vibe making for a slightly less immediate listening while providing the band's music with a more contemporary feel than was the case in the past. Like the aforementioned Silicon Messiah, the bulk of Tenth Dimension's songs owe a heavy debt to early METALLICA (circa Master Of Puppets), a factor that works in Bayley's favor as the more downtuned nature of the material allows him to utilize his middle register to great effect, as particularly evident on the SABBATH-tinged “Stranger To The Light” and the record's most ambitious cut, “Meant To Be”. 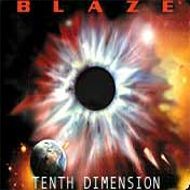 If I had to pinpoint BLAZE's greatest strength, it would undoubtedly be their knack for delivering songs that revolve around clearly-identifiable, catchy choruses, a feat that is made all the more impressive by the fact that Bayley's vocal range remains fairly limited (albeit much less so than in the past). While so many metal acts seemingly construct their compositions around guitar riffs, often at the expense of the vocal melodies, BLAZE manage to execute hook after hook despite their singer's obvious shortcomings, consistently churning out tunes that are chock-full of memorable riffs and huge choruses that stay with you virtually upon the first listen. Although it's unlikely that the die-hard IRON MAIDEN fans will ever forgive him for leading the band “astray” during his relatively short stint with the group, Blaze Bayley has more than redeemed himself with his subsequent two offerings. Tenth Dimension may not be a perfect album, but it is one that most definitely deserves to be heard.